The Maid-Rite Dress Co. was formed in 1920. As described in Women's Wear, 13 May 1920, pg. 16, "The Maid-Rite Dress Co. is a new firm located at 162 West 21st street, manufacturing a line of tricotine and serge dresses. All designing is done by Joseph S. Zanfini, a member of the firm, who was formerly designer for the International Dress & Skirt Co. The other members of the firm are Herman S. Kohn and Jacob Adelman. For the past three years Mr. Adelman has been conducting his own dress factory. The fall line is ready and the following salesmen will soon leave for their respective territories: Julius Bearnheimer, South; Al Engler, the Middle West, Adolph H. Kulka, Washington city and the States of Pennsylvania and Maryland, and Julius M. Wile, New York and the New England States." Maid-Rite moved from 21st St. to 29th St. a short while after formation: "The Maid-Rite Dress Co. has moved from 162 West 21st street to the new building at 40 [sic] West 29th Street, where the firm has leased the entire fourth floor, and fitted up a showroom as well as modern stock and shipping rooms. All manufacturing will be done in the spacious new quarters. The initial showing of the Maid-Rite fall line, consisting of dresses in tricotines, satins and serges, designed by Joseph S. Zanfini, will commence tomorrow morning" (Women's Wear, 12 July 1920, pg. 16). 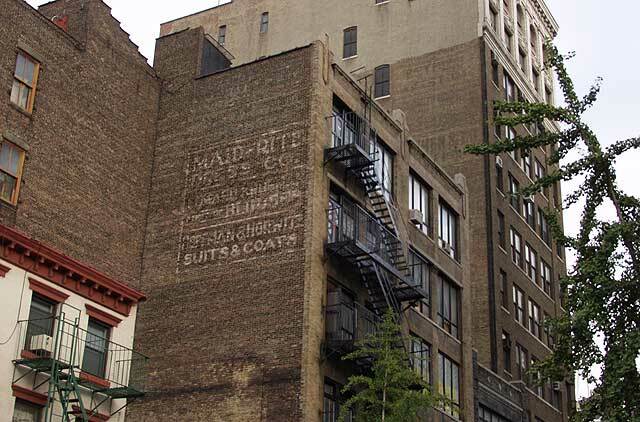 The Maid-Rite Dress Co. was located at 45 W. 29th St. from 1920 to 1921. An inaugural ad for Maid-Rite ran in Women's Wear, 13 July 1920. This one, July, 1921. Two of the people involved were Jacob Adelman (1888-1938) and Herman Sigmund Kohn (1877-1937). Jacob Adelman registered for the World War I draft in 1917 when employed as a manager at the Veteran Dust Exterminator Co., 100 Greene St. The Veteran Dust Exterminator Co. manufactured sweeping compounds for industrial use. This company seems to have been derived from Kohn & Hecht founded around 1900 by "oil dealers," Herman Kohn and Emanuel M. Hecht (1870-?). Herman Kohn was born in Zanesville, Ohio, 25 Aug. 1877. He appears in the U. S. Census of 1900, age 22, living in New York, where he gave his occupation as "Oil Merchant." Emanuel Hecht appears in the same census living with his father-in-law, Manuel Mendoza, an oil salesman. Hecht, like Kohn, gave his occupation as "Oil Merchant." Kohn and Hecht continued to cite "Oil Dealer" as their occupations in the 1910 census. In the 1920 census Jacob Adelman gave his occupation as "Dresses Himself Own Account," while Kohn was still an oil merchant. Adelman stayed in clothing manufacture until his death in 1938. This brief obituary of Herman S. Kohn is from the New York Times, 21 Nov. 1937. Other death notices for Herman S. Kohn were entered by the Hungarian Society of NY, the Sweeping Compound Manufacturers Co. of NY, and the Veteran Supply Co. Veteran Supply Co. was another name for the Veteran Dust Exterminator Co., which also went by the names of the Dustdown Co., Dust Exterminator Co., and American Dust Absorbing Floor Oil Co.
Kohn's company also seems to have served for a time as a New York outlet for the Fitch Dustdown Co. of Cincinatti. In 1906 James B. Fitch registered a dustdown trademark with the phrase "There's Only One." This was described as a "dust-collecting sweeping powder and powder for dustless sweeping," and its first use in commerce was 3 Nov. 1904. This advertisement for the Fitch Dustdown Co. appeared in Fairchild's New York Men's Wear Directory, 1907. This later one appeared in The Rotarian, vol. 4, no. 9, May 1914. At the bottom of these three signs is Hoffman & Horwitz / Suits & Coats . The partners were Jacob Hoffman (1884/85-?) and Harry Isidor Horwitz (1887-1966). Both were immigrants from Russia in the 1890s. Hoffman & Horwitz, Suits & Coats, was formed in 1920 and located in this building from 1920 to 1923. They moved out in 1923 to 16 W. 32nd St., then to several other locations in the garment area until going out of business around 1940. The sign in the middle between Maid-Rite and Hoffman & Horwitz reads Edward Kreuger Blouses.